Snow fell earlier this week, pretty much ending the motorcycle season for most sane riders. There are still a few diehards out there dodging the slick piles of leaves (the trees are finally letting go!) and braving the cold winds. On Tuesday, when the evening commute was accompanied by a mist of snowflakes, I passed a woman riding primly on a scooter. She wore a visor-less helmet and had a lap robe draped across her knees. The fringe tossed in the soggy wind. She looked like a granny minus her rocker. She had to be uncomfortable. I just received a notice from the Hosanna! Bikers were cancelling their November ride because of the weather. Time to batten down the hatches. Ralph and I celebrated our October wedding anniversary with a ride along the Mississippi River to Reads Landing, where we had lunch at Reads Landing Brewing Company (great sandwiches, local beer). The trees were just beinning to turn color then, and the weather was a little on the cool side, but not uncomfortable. If you had told me 34 years ago that I’d be riding on the back of a bike at age 60, I would have laughed my head off. Now there are times when I’d like to make it a way of life. After lunch we drove a couple of miles further south to Wabasha and crossed the river to Wisconsin. We were immediately passed by a posse of crotch rocket dudes. Heads down, speeding through the curves, they clearly weren’t interested in the changing leaves or the tall limestone bluffs along the highway. Time will come when their testosterone levels drop and they’ll want to slow down and actually see where they’re going. By then, maybe, they’ll be ready for a book like Ride Minnesota. October was a good month for the book. I sold 21 copies in one day at the Twin Cities Book Festival. The owner of SubText Books in St. Paul dropped by and said she wanted to sell the book in her store. And I learned the name of another place in Cambridge that may be interested in carrying it. The following weekend was not quite as successful–I sold just 13 copies at the Home Improvement & Design Expo. But that’s more than I would have sold had I stayed home. And, I learned about a Dunn Bros. Coffee initiate called coffeeandbooks.com that I have to check into a little more thoroughly. 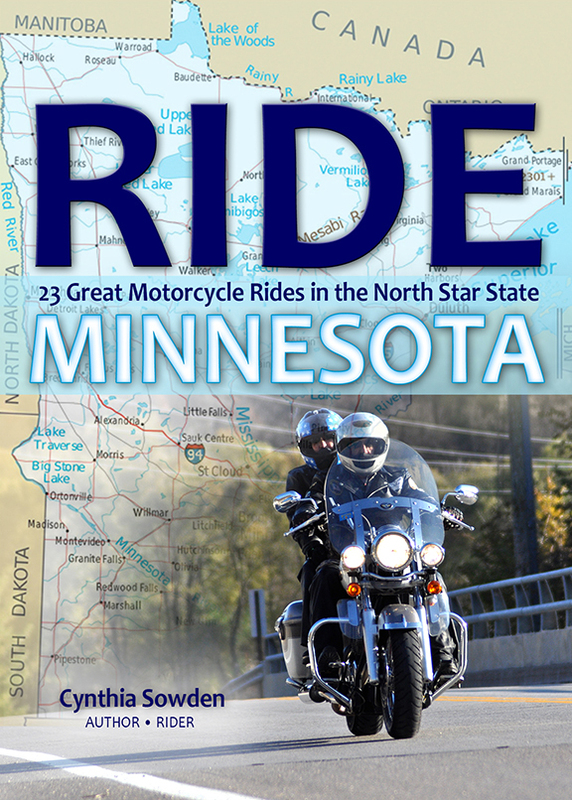 The month ended with word that Hennepin County Libraries had ordered the book. 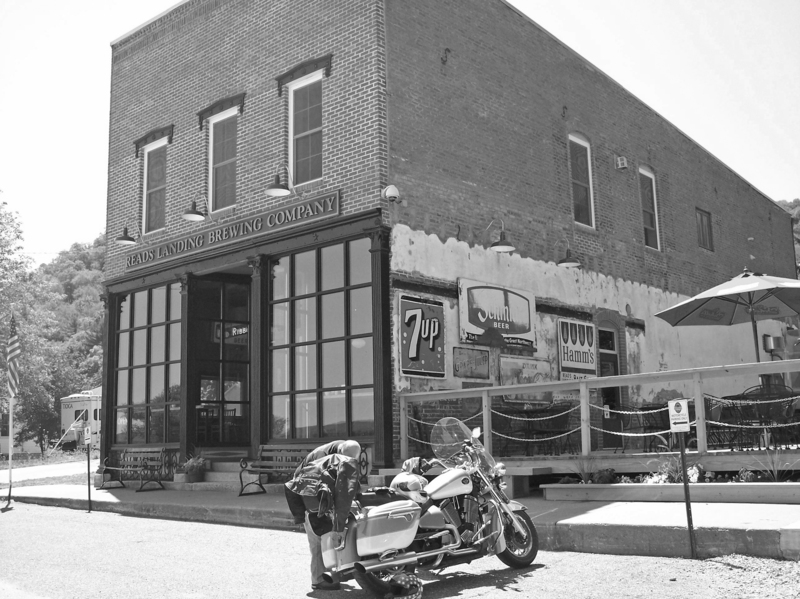 Reads Landing Brewing Company graciously offers motorcycle parking. One of Ralph’s dreams is to ride the Victory to Washington, DC and join the Rolling Thunder rally. 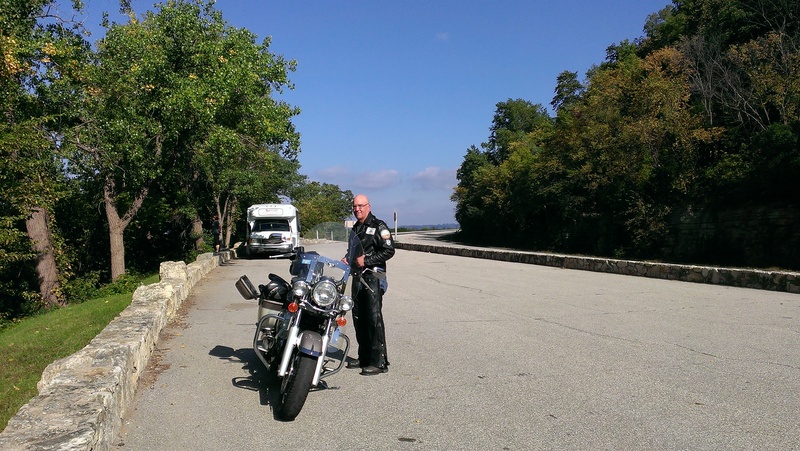 Honoring fellow veterans fires his imagination in a way that going to Sturgis doesn’t. I have to admit, there is something thrilling about joining a big ride. 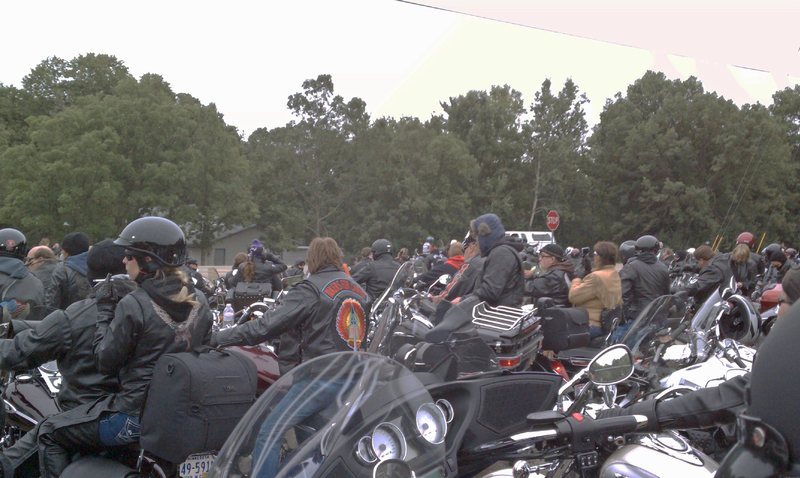 We joined the Twin Cities Victory Riders for a cruise down to Spirit Lake, Iowa, a few years ago. We had the option of taking a tour of the Victory manufacturing plant, but it was a gorgeous day, too nice to spend indoors. We did the Spring Flood Run a couple years back. Thirty thousand rumbling, snorting motorcycles. It’s a high-octane, testosterone-fueled event (although there were plenty of women bikers in the crowd, too.) We started all together in Lake St. Croix Beach. 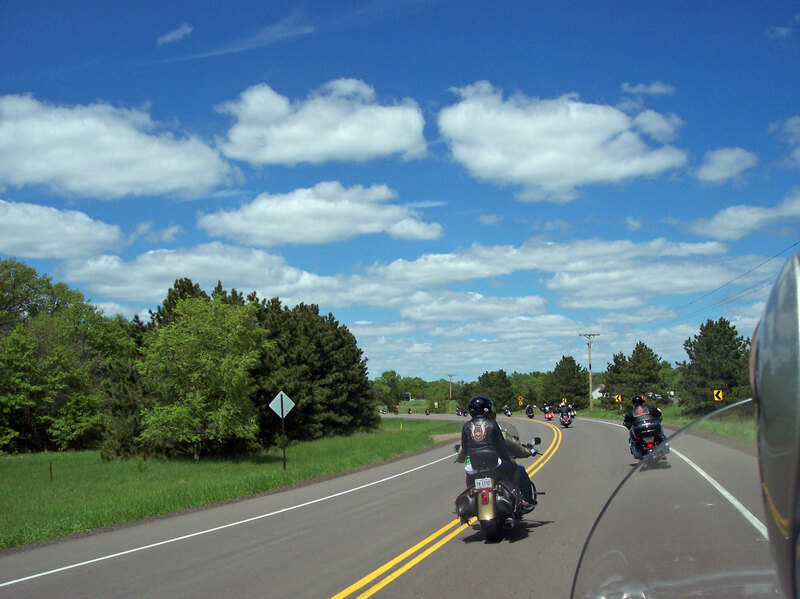 Some peeled off toward Winona, others headed across the Mississippi River to Wisconsin. Some, I’m sure, got no further than the bars in Prescott. For others, like ourselves, it’s the ride. 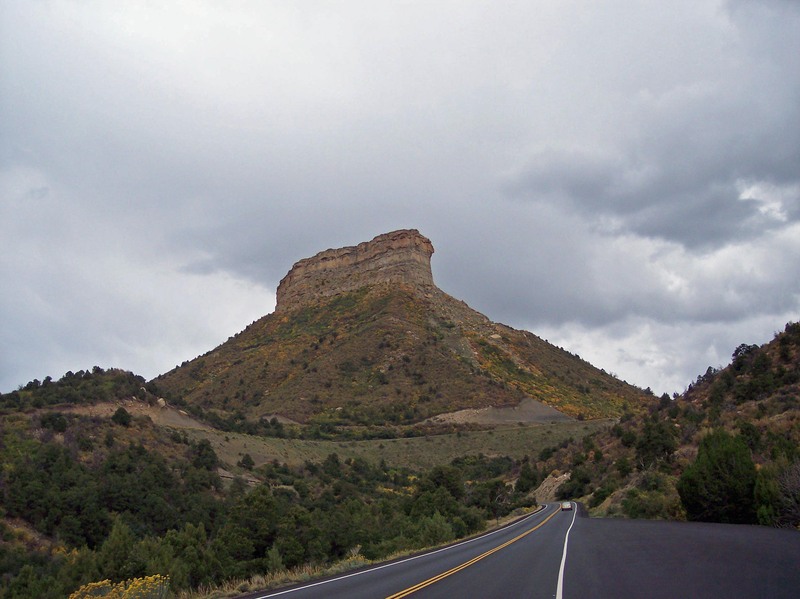 Once we hit the open road, we just have to see the next town, feel the next curve, climb the next hill. On June 15, we’ll join the Hosanna! Bikers from Hosanna! Lutheran Church in Lakeville for their annual “Blessing of the Bikes.” The day includes a ride, lunch, blessings and music by the Daisy Dillman Band. And the organizers said I can take orders for, but not sell, Ride Minnesota. It should be a great day!